On the other side of television sets in third- and fourth-grade classrooms throughout central New York and greater Boston, students would do as Madame Slack instructed, listening and repeating the vocabulary and verbs she enunciated in an exact Parisian accent. Photo: After the “Parlons Français’’ project, Mrs. Slack taught advanced French at Boston University and Harvard University. As the host of “Fun with French’’ on WRGB-TV in New York and later “Parlons Français,’’ part of WGBH-TV’s 21-Inch Classroom program in Massachusetts, Mrs. Slack was on the forefront of a teaching method educators are still trying to fully integrate into classrooms: distance learning. “Anne Slack pioneered distance learning before the term even existed,’’ said Rebecca Valette, a friend and professor emeritus of Romance languages at Boston College. Mrs. Slack’s 20-minute, twice-weekly language lessons were interwoven with photographs and film sequences she shot in France during the summers, as well as conversations with puppets, all of it intended to give students early, and more complete, exposure to French language and culture. For some of her young students, Mrs. Slack’s program was life-shaping. After the “Parlons Français’’ project, Mrs. Slack transitioned to teaching advanced French courses at Boston University and later Harvard University, giving workshops and lectures throughout the country and serving as president of the American Association of Teachers of French. “She worked very hard, and she was very modest about her accomplishments,’’ said her son, Lawrence of Brooktondale, N.Y.
Mrs. Slack, who had retired to upstate New York to live with her son about 15 years ago, died of natural causes in her sleep Feb. 12 at Cayuga Medical Center in Ithaca, N.Y. She was 94. Anne (Benchimol) Slack was born in Oran, Algeria, along the northwestern Mediterranean coast. Fluent in French, Spanish, English, and Latin by the time she completed high school in Oran in 1933 and then her Licence-ès-lettres, the equivalent of a bachelor of arts degree, in the mid-1930s, Mrs. Slack worked as a tutor to help her family get by. When World War II arrived in Algeria, she worked as an interpreter for the US Army’s Engineering Headquarters of the Mediterranean theater of operations, Valette said. Mrs. Slack did such a good job she was sent to assist US officers in Vichy-controlled Casablanca, Morocco, her son said. While there, she met Raymond E. Slack, Jr., a young man from Niagara Falls, N.Y., who was serving in naval intelligence. The couple was married in 1947 in Niagara Falls. The Slacks moved to Schenectady, N.Y., where Mrs. Slack took a position teaching elementary school French first at the Brown School and later coordinated the city’s Foreign Language in the Elementary School program, Valette said. In the mid-1950s, Mrs. Slack began collaborating with Albany-based WRGB-TV on a new program called “Fun with French,’’ which eventually reached 110 area elementary school classrooms, Valette said. Having noticed the program’s success, in 1959 the Massachusetts Modern Language Project recruited Mrs. Slack to relocate to the Boston area to serve as on-screen host and associate director of “Parlons Français,’’ a new television program for WGBH-TV. She also was involved in developing the tapes, workbooks, and teacher in-service manuals for the program. “They had a better studio, equipment, and a little better budget, so she could go to Europe in the summer and film,’’ said her son. It’s estimated that the program reached more than 2 million students in the United States and Canada during its lifespan, her son said. “It took off, and no one expected it,’’ he said. “Parlons Français’’ ended in the mid-1960s, and in 1970 Mrs. Slack accepted a position as lecturer at Boston University. She also hosted weekly French radio broadcasts in Boston. In 1976, she moved to Harvard University, where she was a senior lecturer in French until her retirement in 1993. Mrs. Slack was vice president of the American Association of Teachers of French from 1972 to 1975 and president from 1977 to 1979. For her lifelong commitment to promoting French language and culture in the United States, Mrs. Slack earned several recognitions from the French government, her son said. Mrs. Slack’s husband died in 1994, and she decided to move to New York to live with her son and be closer to her grandchildren, Hannah and Jonathan. She also remained active in the foreign-language community at Cornell University, her son said. In addition to her son and grandchildren, Mrs. Slack leaves a sister, Stella Benchimol of France, and several nieces and nephews. Growing up a baby boomer north of Boston, I attended grades 2-4 in a 4-room converted fire station. Twice a week, a B&W TV was rolled amongst those of seated on our “sit upons”. With necks craned, we delighted at the antics of puppets, short scenarios, songs, and repeating phrases. Madame Slack initiated by life long fascination with language, my love of all things French and a foundational yearning to travel. Although my “language” career took a curve to computer languages, French (a minor in college) allowed such varied experiences as studying advanced mathematics from a French theorist, comforting a group of men devastated by earthquake, introducing sons and nieces to the joys of international travel, and working with Haitian girls eager to learn English in pursuit of a teaching degree. For all this and much more, I credit Madame Slack as the inspiration. I was a third-grader at Grout Park School in Schenectady and I was thrilled to be chosen to be on the show and playing a wolf in a children’s song. Anne Slack was a fine educator and a sweet lady. I remember watching Madame Slack in the early sixties on tv in Scotland! I was hoping to find a picture of her with the puppets, Patapouf and Cliquot. Fond memories. Such warm memories of this show! I well remember seeing this for at least a year or two at the Glover School in Marblehead, MA. I do not remember that particular song about the bird losing his feathers but I remember very distinctly that the closing theme music if not the opening as well was the Radetzky March of Johnann Strauss. To this day whenever I hear this March, usually as the last piece in the Vienna Philharmonic New Year’s Day concert I always warmly think of Anne Slack. I remember that song so well! You counted down the number of “plumes” the bird lost. We watched it on TV in Berlin MD in 1966 – 6th grade for me. I loved TV French and was inspired to take French all through high school and college. Hi there, did you ever find any information about “How Can I Tell you”? My sister has remembered the song from that show but we can’t find any information about it. Thanks and hope you found the film, “toomph”. Any luck finding out about “How can I tell you?” I have had that theme song in my head for almost 50 years! Not much info out there on the web. Any scoop you have would be greatly appreciated! I am from Montréal, Québec and now 48 yrs old. I remember when I was about 6 or 7 years old. I watched that program “Parlons Français” At that time in the early 70’s, I guess they were reruns. They were airing on Radio Québec Channel. “All About You” is one program that is still deeply ingrained in my middle-aged mind from my early childhood days. I remember watching the show often in the first grade in 1974. My school had all black and white TV sets even in the ’70s, so I had no idea that “All About You” was telecast in color. Louise McNamara was always pleasant and in her own soothing way made learning enjoyable. There was another TV show on ITV that I think was called “Ripples” that we used to watch in the first grade. I don’t remember the format of the show too well, just the opening that showed ripples in the water of a lake. If my memory serves me right “Ripples” followed “All About You” on the program log? I remember being invited to do a 21-inch classroom segment in I think 1961. There were 8 of us from our 5-6th grades that got to tape a segment of “Parlons Francais”. Miss Nancy was the lady that was our tutor for the segment. I remember it was exciting because we used the “Bozo the Clown” circus ring to film the show. I think we met Madame Slack. I do remember watching the show at school and at home. I got my love of French from Parlons Français in the late 1950s early 1960s when my teacher would roll the television into the All Purpose Room twice a week and we would écoutez and répétez avec Madame on the (then) very new (DC) Public Broadcasting station while attending Colesville Elementary School in Montgomery County in Silver Spring MD. Sadly, our Montgomery County elementary schools no longer have this sort of provision for students. Foreign language learning is something you pay extra for and take in before and after school classes. I can’t tell you how twenty minutes minutes twice a week inspired me to carry on in French, and later Spanish. It awakened in me a love of other cultures and inspired a love of travel and language. Thanks for sharing the memories, Rick. My 4th grade class was the first year Boston was introduced to Madame Slack. My class at the Elihu Greenwood School was in a documentary of learning French. The director’s first name was George. I can’t remember his last name. I would love a copy of this documentary to show my children and grandchildren, and to see myself as the child I once was. I had a speaking part. It was an experience I’ve never forgotten. Can anyone help me or point me in the right direction? I did a little research, and this is what I learned. The WGBH Archives holds several episodes from the first season of the Parlons Français program, hosted by Anne Slack, but they are still on 16mm film negative masters, and not easily viewed. The Archives staff believes there are also 16mm copies at the Library of Congress in the NET Collection, but equally difficult to access. As to your other question, we believe the documentary director was most likely George Tuttle. If there are other alumni who can shed more light on this, please do. Ah! They were BAIRD puppets! I should have remembered that. But what were the puppets’ names? My first paid job at WGBH was directing the show “Parlons Francais” It was hosted by Anne Slack. Mr Barzyk — What is your association with French in Action? Are you the mysterious man in black in the final episode? As a young language learner of French in the late 50s and 60s, I too watched the Parlons Francais series. It was extremely well done. I have been teaching French now for 42 years. Thanks for your work on the Parlons Francais series. Yes, you caught me. I was the one in black. I worked with Pierre and Barry on the series as director. I then went on to exec. prod. the Spanish language series, “Destinos.” I also did the English as a second language series, “Connect with English,” and the German language series, “Focus Deutch”. And alas, I never really learned any of these languages. I was spoiled. Where ever I shot, the actors and crew all spoke English. Congrats on your service to the French Language. Have a great New Year. I learned to speak French as a child from Parlons Francais in the 1960’s. When I travelled to France as an adult 40 years later, I recieved many compliments about my vocabulary and accent, which I attribute to this series. I tried to get a copy, and actually talked with Madame Slack (she was in Ithaca at the time) – trying to find a copy of the series to get transposed into DVD or podcast etc. Unfortunately her leads were blind alleys – an original set that she lent for somebody’s dissertation was lent to another, then another and … She also told me that Harvard had a complete set of the films, but they had picked up a static charge, posing a fire hazard, so they were destroyed. Does anyone know if anyone has managed to preserve the complete set? I have searched high and low for something as engaging and effective for teaching French to children to no avail. Though I wound up taking German by the time I got to take a second language, in junior high school, I do remember “Parlons Francais,” as I used to watch WGBH when the day side of Channel 2 was known as “The 21-Inch Classroom” (the moniker derived from the then-standard screen size of television sets). Some of my elementary school teachers utilized programs of ‘GBH then, including the Language Arts series’ “You Come Too” and “Imagine That,” at least the latter produced at ‘GBH, hosted by a Marcia Chellis, whom I later read went on to become an assistant to and wrote a tell-all bio on Joan Kennedy, Senator Ted’s first wife. Do either of those series’ ring a bell? I also remember when ‘GBH aired the internationally (Canada & the U.S.) televised “The Friendly Giant,” as played by Bob Homme, who is in Canada what “Mister Rogers” is in the United States–a children’s broadcasting legend. When I was real young — in kindergarten and first grade, ‘GBH aired a program called “KinderGarden” or “Kindergarden,” hosted by a Dr. or Miss Frances Jordan. Do you have any idea if I could find out anything about that program, if ‘GBH would have any records of having broadcast that show, or if possibly any kinescopes or videotapes of it survive anywhere? I was lucky enough to have found some episodes of “All About You” on a Canadian website, don’t know if any of “Land & Sea” survive? Another excellent educational TV series was the Time-Life affiliated “The World We Live In,” which my sixth grade science teacher (who was also my homeroom teacher) had us watch. The cinematography of that series was superb, as one might imagine having had the cooperation of Life Magazine. Another fixture of WGBH, who hosted two programs teachers of mine had our classes watch, was Boston area folk singer Tony Saletan. I am sure you remember him. In second grade, our teacher showed us “Sing, Children, Sing.” In fourth grade, our teacher had us watch “Field Trips,” in which Saletan took students to historical sites such as Plymouth Plantation and Old Sturbridge Village, and Fort Ticonderoga. Edited segments of this later program were incorporated into the nationally-televsied “What’s New?,” a kind of magazine series for the middle school/junior high or older elementary school set. Is there any way to find out if ‘GBH or any PBS affiliates that were formerly affiliates of National Educational Television (NET, the precursor to PBS) and the Eastern Educational Network (EEN) would have surviving kines or videotapes of some of these fondly-remembered and highly-regarded instructional TV series? Do you even have any kines or video of an episode of “Parlons Francais,” the very show you directed? That later show featured an improvisational troupe from Cambridge, Mass. called The Proposition Theater, which at one time had as a member an aspiring actress name of Jane Curtin. And I remember the dulcet tones of William Pierce telling us we were watching a “21-Inch Classroom program,” and that “This is the Eastern Educational Network.” Great days, great programming. It would sure be great to track down any surviving episodes of these programs, and to have a repository at which tio safeguard them for the ages. I will ask some of our alumni to let us know if there are answers to some of your questions. Wow. What a memory. I did “All About You.” I did most of the Tony S. field trips. I remember most of the shows you are writing about. WGBH Archives has one of the most extensive collections of shows in the country. Many of the early shows were erased because the tape cost so much it had to be used over and over. I will send your email to Keith Luf at WGBH archives. He can bring you up to date on what still exists. Can you tell me a little more about you? Are you in the business? Why are you collecting these materials? It is great to hear from you. Please keep in touch. I saw a YouTube video of “Parlons Francais III,” not with Anne Slack, but someone else, and saw your name on the credits. I loved that show! For the longest time, I wanted to be a French teacher. I never did become one, but always had a love for languages and wishes that I had become a language teacher (I went into the sciences instead, had a family, and the rest was history). Maybe I’m becoming nostalgic in my 50’s, but have been interested lately in all the old TV shows that I loved, especially the NET/PBS shows. There was another language show, “Guten Tag,” a German language program, which I see is on Iowa Public Television, but I don’t even know if it’s the same as the old show on Channel 2. I wonder if you could contact me also with someone in the archives dept. of WGBH, to see what still remains of these two programs. I wonder if there were textbooks that went with them? Anyway, I share the same fondness as the others for those great programs and those great times! Thanks for your help! Of the Saletan shows you referred to, I directed perhaps six, which were made at WHDH studios following the fire, and which were distributed on NET. That production run was fraught with problems, given that the station management only wanted Tony in front of a rear screen, and I, in my youthful enthusiasm, literally filled the studios with elaborate sets by Dave Robertson, and people from the applicable countries, telling of their homelands and performing material from their cultural heritage. Bob Larsen and Greg Harney, on the first day of shooting, when they saw what I was up to, got me in a conference room at WHDH and gave me hell. But I think they saw that they had a really attractive product on their hands, and let me go ahead – after all, at that stage, what could they do? There may have been more of this series, but I was not involved. I directed the first of the ‘Field Trips’ series. As I recall, we shot at Old Sturbridge Village, The Mayflower/Plymouth Plantation, The Constitution and Mystic Seaport. There were more, I believe, but I think I did only the first four. As these programs were taped, and were major productions, I would be very surprised if ‘GBH didn’t have copies in the archive. And as regards the “21 Inch Classroom” materials, I would suggest consulting Michael Ambrosino, whose memory on these things seems still very vivid. It is possible that some of them are also in the archives. Don’t know if any of this helps but you raised some fine remembrances. As you remember, Fred, we were both active with “The 21-Inch Classroom” at that time. Then, I moved on to the filming of Anne Slack’s Parlons Francais series in western Massachusetts, where I assisted the film director. It was great to work with puppeteer Bil Baird and the film crew! In fact, I have and cherish some original drawings of Bil Baird’s puppets, saying French words but doing off-color things – we called them the “dirty French pictures” at the time – such things as “Wee, Wee.” Your imagination can complete the actual drawing. Half of ‘GBH joined us at the Schine Inn’s swimming pool every weekend! Anne Slack and I became great friends – she was a bride’s maid in the wedding of Bob Moscone and me. And I also directed the Tony Saletan series. Still favorite songs are “Mingo Mountain” and “B-I-N-G-O.” In fact I named a cat Mingo, but have not had a dog who fit the name Bingo. Who can forget “The Birth of a Bat,” the first of its kind in time-lapse photography on Cap Weston’s PBS prize-winning “Exploring Nature”? Or all the children’s authors who were on “Literature: Grade 3” including Robert McCloskey (Make Way for Duckings) with the BPL’s Beryl Robinson? Or “Life in a Pond,” where we spent hours getting a camera to show a close-up of a drop of water on a microscopic slide? And what about that raccoon who was Cap’s “friend” who we used to take for a stroll on a leash around the studio? The opportunity to direct those types of things created very special memories! However, I doubt if any of the old kines are still hidden away somewhere. What wonderful memories. The thing I remember most about the series of field trip shows was the unmerciful rain. The lifeboat on the Chas. Morgan was equipped with a camera and filled up with water and nearly electrocuted the camera man – was that Don Hallock? I remember pulling cables out of foot thick mud, changing the oil in the genny on Beacon Hill so the electricity would stabilize. Fond memories all! This was what I cut my TV teeth on. What an intro to the Biz! It has been 50 years now since then. All great fun and not a single regret. Actually, the cameraman in the Morgan lifeboat was not me, but probably Woozy Harris. I was directing that one. You were always good with cables and mud, Al. Actually, you were great with just about everything you did – endlessly valuable you were! 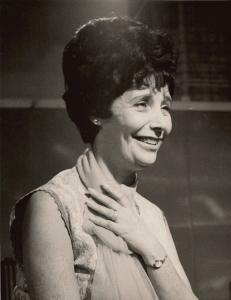 In the mid-60s WQED out of Pittsburgh aired and syndicated Miss Jordan’s TV Kindergarten, scripted and produced by Frances Jordan, directed by Norman Stein. They eventually married and after just several successful years of TV Kindergarten Francis went on to get her PhD at the University of Iowa.of Iowa. Frances and Norman then taught in New Orleans at Loyola university before relocating to southern California. The two of them are now officers in Toastmasters International where Dr. Francis Jordan-Stein continues to practice her extraordinary teaching talents! Of all of the many wonderful TV kindergarten programs that Frances created, none survived because WQED could not afford to keep the tapes–they programmed over them! Hello Mark, and thank you for post about Dr. Francs Jordan (Stein) and her wonderful “Kindergarten series that originated at WQED Pittsburgh and made enough of an impression on me that I remember it now over half a century later. I am just curious as to how you came to know Dr. Jordan-Stein? Did you once work at WQED, or what is the relationship you have with this beloved TV teacher? I did find a few items related to WQED’s “Kindergarten” since I made my first post on this WGBH Alumni blog, and that I would like to share with you if you would send me an email address to which I may send them. One of the items indicates there could be some surviving films of the series. My email is “jimmo531” at Yahoo dotcom. The replies to my posts here have been very encouraging, and I am pleased to also see they have spurred some memories for others of these fondly remembered broadcasts of early educational television. It is great to know there are still wonderful people like yourself out there who share with me this appreciation of our broadcasting culture. So please drop me a line when you have some spare moments.